"... and make it so I never have to leave Phoenix. Amen." 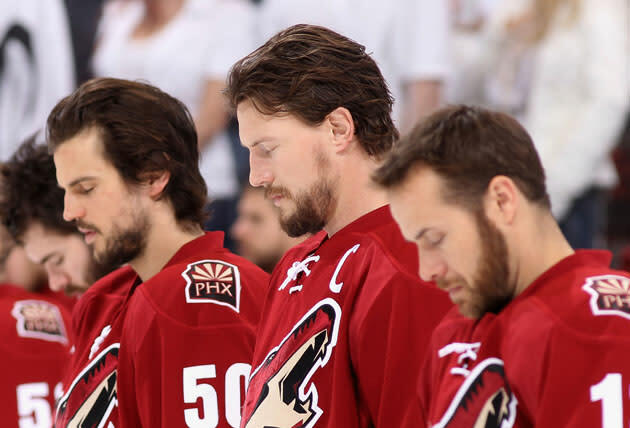 The Shane Doan saga has finally come to its merciful end, as the Phoenix Coyotes' winger and captain has decided... to remain the Phoenix Coyotes' winger and captain. According to John Gambadoro in Phoenix, Doan has re-signed with the only franchise he's ever known for four years at $21.2 million. It's worth noting that this is a $300,000 decrease on the $21.5 million extension Gambadoro reported that Doan had agreed to last Friday. Now, it's possible that Gambadoro just had the numbers wrong, but considering the showing of loyalty we're witnessing here, it certainly seems more likely that Doan just gave a little money back. His willingness to endure with this franchise knows no bounds. I mean, heck, according to Darren Dreger, the contract comes with a $2 million signing bonus deferred until after the contract expires. With a lockout looming, most guys would want it now. But not Doan. The man is loyal to a fault. Seriously, if Coyotes fans ever criticize him again, they should have to turn in their fan cards. There were rumblings Thursday night that, if Doan was leaving town, he would be headed to the Vancouver Canucks, a team whose ownership situation was as steady as any team in the league's, was situated in a place he and his wife are familiar with, might give him a better opportunity to win now and, according to agent Terry Bross, blew him away with their presentation. Bross said he loved the Canucks' front office, and that he called them 1st class. What this tells us: Doan was tempted, and this is to say nothing of that ridiculous 4-year, $30 million offer from the Buffalo Sabres. He looked around and he chose where he would move if necessary, but in the end, when you don't want to go, you'll find a reason to stay.